The Secure Remote Access (SRA) browser client is the quickest and easiest way to access and use a VM. 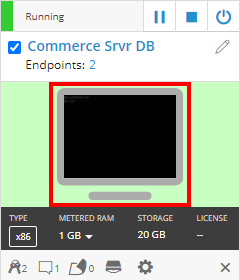 To open the SRA browser client, click on the picture of the VM displayed on your environment or sharing portal page. You can then interact with the VM in your browser window. No additional software or plugins are required. From the environment page or a sharing portal, click on the thumbnail image of a running VM. The VM desktop or console opens in your browser window. Use your mouse and keyboard to interact with the VM. Use the toolbar at the top of the screen to change the VM power state, access any saved credentials, and customize your VM session. For more information about the toolbar, see Supported actions in the browser client toolbar below. A supported browser, such as the latest version of Chrome, Firefox, Microsoft Edge, Internet Explorer 11, or Safari. At least 1.2 Mbps for each concurrent browser session with a VM. Low latency (150ms or less) to the region where your VMs are located. Use the Connectivity Checker tool to quickly test whether you meet the minimum access requirements. For more information, see Access requirements. 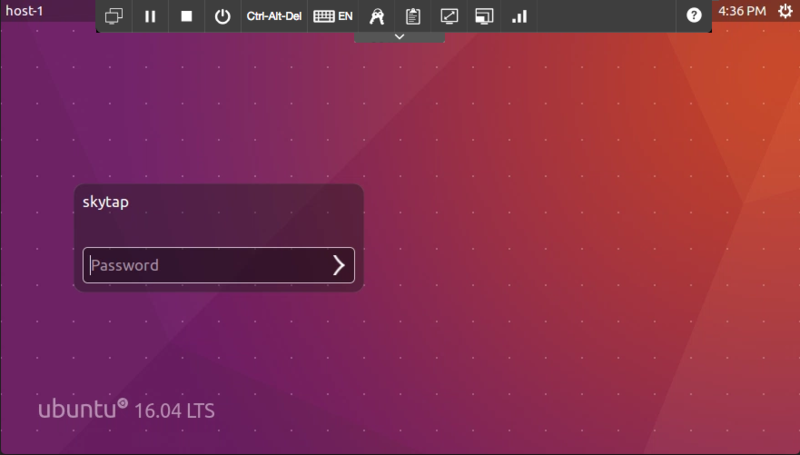 When you use the SRA browser client, the toolbar at the top of the screen provides helpful tools for working with the VM. Click to display a list of the VMs in the environment. To return to an environment-wide view, click the View all VMs link. If you are a logged in Skytap user, the View all VMs link opens the Environment Details page page. If you are accessing the VM from a sharing portal, the View all VMs link opens the sharing portal page. Click the power buttons (for example, ) to run, suspend, shut down, or power off the VM. For more information about the power options, see Running and stopping VMs and environments. If the power buttons are missing, you do not have access to run, suspend, or shut down the VM. For help, contact your administrator, instructor, or the person who provided you with access to the VM. Power A particular type of CPU that supports IBM i, AIX, and Linux in Skytap Cloud. VMs do not support suspend. Click to send the Ctrl+Alt+Del keyboard combination to the VM. Click to send common keyboard shortcuts to the VM to show an on-screen keyboard. The Keyboard layout: field displays the language of the on-screen keyboard. To change the keyboard layout, see the instructions below. To type keyboard shortcuts directly from your local keyboard instead of the on-screen keyboard, see Keyboard shortcuts for browser client and SmartRDP. Click to change the keyboard language mapping recognized by the VM. The language settings for the on-screen keyboard that is displayed when you click Show Keyboard. How the keystrokes from your local, physical keyboard are interpreted by the VM. Do not change this setting unless you have a physical keyboard that matches the new keyboard layout or unless you plan to solely use the virtual, on-screen keyboard. The Keyboard layout setting does not change the guest operating system language settings in the VM. You must configure the guest OS to use the same language as the Keyboard layout setting. For more information, see Using an international keyboard during an SRA session. Alternate keyboard layouts are not supported for Power VMs. Click to display the usernames and passwords saved with the VM. To paste a Username or Password into the currently selected VM window, click Insert. If the VM has more than five sets of credentials, scroll the drop-down list to see all of them. VM credentials cannot be edited in this view. If you have a Skytap account, edit the credentials from VM Credentials page. If you do not have access to edit the environment, contact your administrator, instructor, or the person who sent you the link to the environment. Skytap support does not manage VM credentials. Click to copy and paste text between your local machine and the VM. For more information, see Using the VM Clipboard. If this icon is missing, you do not have permission to copy and paste text to and from the VM. Power VMs do not support copy and paste. Click to change the VM screen resolution to fit the current browser window size. The maximum screen resolution size is 1920 x 1080. Click to select from a list of screen resolution sizes. Power VMs do not support adjustable screen resolutions. 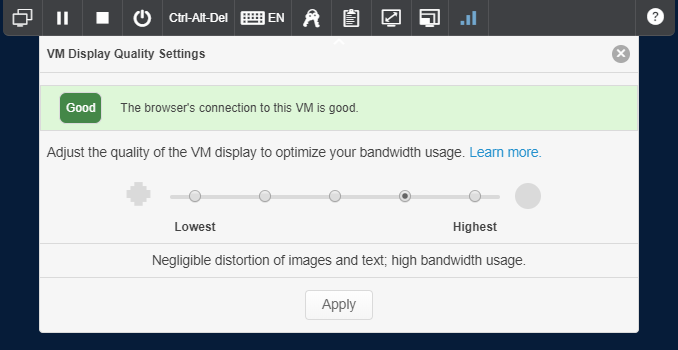 Click to display the quality of the browser connection to the VM or change the display quality. To improve performance, reduce the display quality. A lower display quality reduces the amount of bandwidth that your session requires. For more information, see Improving performance during a browser client session. If the VM has been enabled to support VM audio through the browser client session, the toolbar contains additional icons. Click to switch the connection type or learn more about it. Check the audio status icons to see the whether audio input and output have been enabled. For more information about using VM audio, see Using audio with a VM. 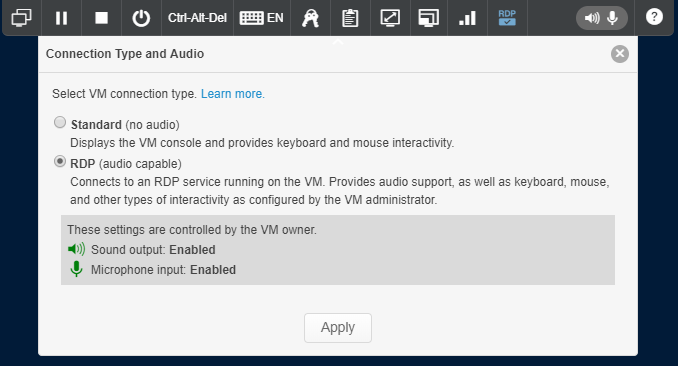 If you are a Skytap Cloud user who wants to enable this feature for a VM, see Enabling audio for a VM. If the VM has been enabled to support SSH sessions through the browser client session, the toolbar contains an additional icon. Click SSH ( ) to switch the connection type or learn more about it. Generally, an SSH session is best if you want a unique, interactive login session. For more information, see Using an SSH connection during an SRA browser client session. If you are a Skytap user who wants to enable this feature for a VM, see Enabling SSH on a VM for use in SRA browser client sessions. Click to collapse or display the toolbar. The browser client may display an error message if your browser session remains inactive or if your network is disconnected. To clear the error, try refreshing the page. If a VM is accessed by multiple clients at the same time, certain keys may become unresponsive. To restore key function, close all of the browser sessions and restart the VM. The Caps Lock and Num Lock keys on the VM may get out of sync with the Caps Lock and Num Lock keys on the physical keyboard. To re-synchronize the keys, either click the Caps Lock or Num Lock key on the VM on-screen keyboard, or press the keys on the physical keyboard when focus is outside of the web client (for example, another window or tab is active). By separating the physical key on and off states from the VM key on and off states, Skytap prevents the client from rapidly turning the Caps Lock or Num Lock keys on and off when multiple users are using the VM at the same. The double quote (") and tilde (~) characters may not work on Ubuntu 14.04 VMs; to fix this issue, adjust the VM keyboard settings from within the guest OS. For more information, see Troubleshooting broken keys on an Ubuntu 14.04 VM. Click the VM screen and try again. This re-focuses your browser window. If you are still having issues, see Restoring keyboard or mouse control.